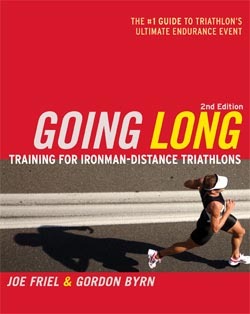 VeloPress is pleased to announce the publication of Going Long: Training for Ironman-Distance Triathlons, 2nd Ed. Internationally recognized triathlon coach and best-selling author Joe Friel has teamed up with ultra-endurance guru Gordo Byrn to update their best-selling Ironman triathlon training book. This second edition of Going Long is now available in bookstores, bike shops, and online this month. Going Long is the most comprehensive guide to racing Ironman-distance triathlons ever written. Combining science with personal experience, Friel and Byrn prepare every triathlete, from the working age-grouper to the podium contender, for success in triathlon's ultimate endurance event. Since the publication of the first edition of Going Long, registration numbers for Ironman-distance races have soared. This new edition embraces this growing group of triathletes who are juggling training, family time and full-time jobs. Sport-specific chapters outline training for each triathlon discipline and describe drills to improve form and efficiency. A newly expanded section on training the mind explores the all-important psychological aspects of racing, including goal-setting and visualization. A detailed appendix includes key training sessions, workout examples, and strength training progressions. Going Long has long been the best-selling book on the subject of training for the Ironman. With expanded content and a new, two-color format, this second edition is once again the premier sourcebook for triathletes who are serious about succeeding in the Ironman-distance. Paperback, 2-color charts and tables throughout. Triathlon is the fastest-growing endurance sport in the world with U.S. growth topping 22% per year. Joe Friel is one of the most recognized names in triathlon coaching and the best-selling author of The Triathlete's Training Bible, Your First Triathlon, and The Cyclist's Training Bible. His clients include professional and amateur triathletes, duathletes, road cyclists and mountain bikers. He is a certified USA Triathlon and USA Cycling Coach and holds a master's degree in exercise science. Gordon Byrn is an elite long-course triathlete and coach certified by USA Triathlon, Triathlon Australia, and the American Swim Coaches Association. One of the best-known ultra-endurance athletes in the world, he has raced Ironman competitions in Hawaii, Australia, Canada and New Zealand. VeloPress is an endurance sports and fitness publisher. VeloPress is the book publishing division of Competitor Group, Inc., publisher of VeloNews, Triathlete, Inside Triathlon, and Competitor magazines; producer of Elite Racing marathons and half-marathons and the Muddy Buddy adventure series; and owner of VeloGear, an online and catalog retailer.